The Gospels and Psalms from the REAL Douay Rheims Bible of 1610 - Life Quest® Formulas, Inc. The Gospels and Psalms from the REAL Douay Rheims Bible of 1610. A true "slavish" translation from the original Latin Vulgate of St. Jerome made using Greek and Hebrew texts that no longer exist, even during the period of the "Reformers". Not as poetic as the King James prose, but more accurate in meaning and substance. Dr. William G. von Peters has transliterated the text of the Douay Rheims Bible into modern english. The price shown is for the digital download in PDF format. 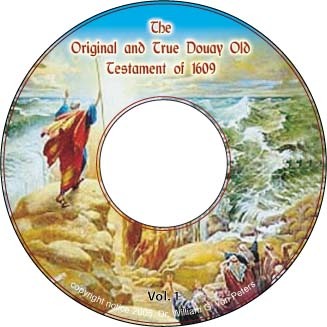 For more information on the REAL Douay Rheims Biblej and other works such as the REAL Gospels and Psalms, Click HERE! The Gospels from the King Jemes of 1611 and the REAL Rheims New Testament of 1582 - in side by side comparative format. The Gospels and Psalms from the REAL Douay Rheims Bible of 1610. A true "slavish" (meaning an exact) translation from the original Latin Vulgate of St. Jerome made using Greek and Hebrew texts that no longer exist, even during the period of the "Reformers". This is our pdf version. Not as poetic as the King James prose, but more accurate in meaning and substance.